11 signs of health problems written right on your face. A person's appearance can tell you a lot about their personal style. Probably even their income level. But the way a person looks also speaks volumes about their health and wellness. It's often enough to look in the mirror to figure out if there's something wrong that your body's trying to tell you about. Dr. Cindy Owen, an expert at the American Academy of Dermatology states "that external changes can signal the beginning of a serious illness inside." So, pay particular attention to these eleven symptoms of internal problems that show up right on your face. When it comes to health problems early detection is key. Before you grab a mirror be sure to subscribe to our blog that way you won't miss any of the interesting and informative articles that come out daily on this blog. All right now, go get that mirror and we'll get started. #11 Discoloration of the skin around the mouth and nose. If your skin has turned grayish bluish in the area of the nasolabial triangle. That's basically your mouth and nose, this may indicate that you're not getting enough oxygen, due to poor blood circulation. This oxygen deficiency can be caused by different illnesses like lung or heart disease. It can also be a sign of Anemia. Which is a drop in the number of red blood cells in your body. Fewer red blood cells means less oxygen being transported to your organs and tissues. If you've spotted this discoloration on your face and it just won't go away. You'd better get to the doctor sooner than later. #10 Extremely sensitive glassy or bulging eyes. If you've noticed these changes in your eyes. This may be one of the first signs of hyperthyroidism or thyrotoxicosis. A disease thyroid gland produces an excessive amount of hormones, as a result, a person needs more oxygen. So, their eyes naturally become bigger. Giving them a sort of constantly scared look. Fat tissue in the eyes become swollen and squishes the optic nerve. That's why many thyroid patients often complain about blurred vision and bizarre color perception. Thyroid issues are no joke. So, it goes without saying if you've got any of these symptoms get to the doctor ASAP. #9 Eyelashes that have become thicker and longer. Who wouldn't want to have long thick beautiful lashes to highlight their lovely eyes. Well, yeah plenty of people but if you feel that your eyelashes have started to grow abnormally fast. This could be a real problem. Experiencing curlier, thicker, longer or more pigmented eyelashes. Or a condition called "Trichomegaly". Some people are born with it. But it can also be caused by serious ailments like Tuberculosis or Immunodeficiency disorders. It's also been cited as a side effect of certain medications. A Puffy face with swelling around the eyes. As well as dry skin and thin fragile hair are some of the first signs of iodine deficiency. Iodine is responsible for proper thyroid function. Again I can't stress enough how serious and unwell thyroid can be. If your thyroid gland is diseased. It affects your whole entire body. Besides these symptoms on your face. If you notice that your weight is constantly fluctuating or you have an increased sensitivity to the cold. It's high time to see an endocrinologist. #7 Soft yellowish spots on the eyelids. People who have "Santhal asthma" or yellowish cholesterol filled sacs on the skin mostly around the eyes. Are at a higher risk of developing heart disease. As harmless as they may seem these spots indicate that the body isn't metabolizing fats properly. Which can result in a condition called Atherosclerosis. In a 2011 study studying 13,000 participants, Danish researchers found that 70% of people who had these cholesterol filled sacks on their eyelids had pretty high chances of developing hardened arteries in the future. They also found that 50% had an escalated risk of having a heart attack within the next several decades. If you notice "Santhal Asthma" on your eyes visit a doctor and be sure to make good lifestyle choices for better heart health like watching what you eat and getting plenty of exercises. #6 Eyelid swelling and peeling. According to statistics, one out of three people who've ever used cosmetic products on their eyes has experienced an allergic reaction to them at least once. 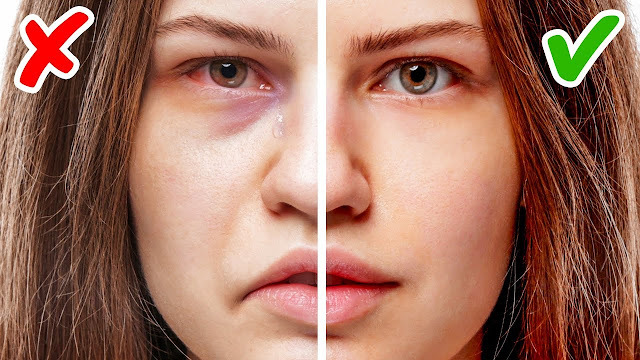 Flaky or red and eyelids maybe your body's Way of telling you that your eye makeup or moisturizer contains some components that your skin doesn't agree with. In most cases, allergic reactions are caused by preserving agents added to cosmetics to prolong their shelf life. To avoid such problems opt for cosmetics with the shortest list of ingredients and always do a test patch on the crease of your arm before putting anything on your eyes. If you suffer from constant itchiness in your ears. This may be a sign of Eczema, Psoriasis or some Sort of allergy. The appearance of Eczema irritation or similar skin problems. Means that you could be dangerously low on vitamin D.
Also known as the sunshine vitamin. Therefore, doctors recommend getting at least ten minutes of Sun a day. If you live in a place that sees more cloudy days than sunny ones. That lack of sunlight can be replaced by supplements and vitamins. Itchy Ears could also indicate a fungal infection. In any case, only a professional can determine the cause of these unpleasant symptoms and prescribe the correct treatment. A sudden change of facial symmetry watery or dry eyes and tingling in the facial muscles. May mean a person has Bell's Palsy. This condition causes muscle weakness or even paralysis. On part of the face it happens, if nerves that control your muscles become swollen, compressed or inflamed. The reason for this problem is most often a viral infection that causes one side of the face to become stiff or droopy. Those who are at the highest risk of developing this condition are pregnant women, flu patients and people with diabetes. On the bright side, the symptoms of Bell's Palsy disappear within two weeks in most people. But you do need a diagnosis first. So, make an appointment with your doctor, if you notice any of these symptoms. #3 Rashes and red Blotches on the face. Symptoms of digestive problems can actually show up on your skin. For example, red bumps that gather into itchy clusters may indicate Celiac disease. It's an Autoimmune disorder that results when Gluten. Which we get from foods containing it damages the small intestine. As a result, it loses its ability to properly absorb nutrients. And if your cheekbones and the bridge of your nose suddenly become decorated with a butterfly-shaped rash it can be a symptom of Lupus. It's another Autoimmune disease that comes with flu-like symptoms. Other possible causes of rash or Eczema allergies or some infection. You know by now that only a doctor can tell you what it is for sure. If a receding chin is accompanied by a small jaw and thick neck. You may be developing Sleep Apnea. People with this disorder actually stop breathing for 10 or more seconds while they're asleep. So, if you wake up with a raging headache feel exhausted throughout the day or snore pretty heavily. Don't ignore these symptoms and seek professional help immediately. # 1 Out-of-control facial hair growth. While it's pretty normal for men thanks to their much larger quantity of testosterone. Women should be alarmed if they suddenly notice an abundance of facial hair growing where there was once smooth skin. If dark coarse hair has started to grow in your chin you may have Polycystic Ovary Syndrome. This is a hormone imbalance. That happens when male hormone levels are elevated in a woman. Make an appointment with your doctor to get the necessary treatment. If I haven't driven the point home enough consult your doctor immediately if you notice any of these symptoms on your face. Sure the internet is full of helpful information but Self-diagnosing and treating won't cut it. Only a professional can get you on the path to recovery and wellness. Do you know of any other visible signs of health problems that people should look out for share your expertise in the comments below. If this article has been helpful for you then share it with all your friends. and family members. Stay happy, Stay healthy.